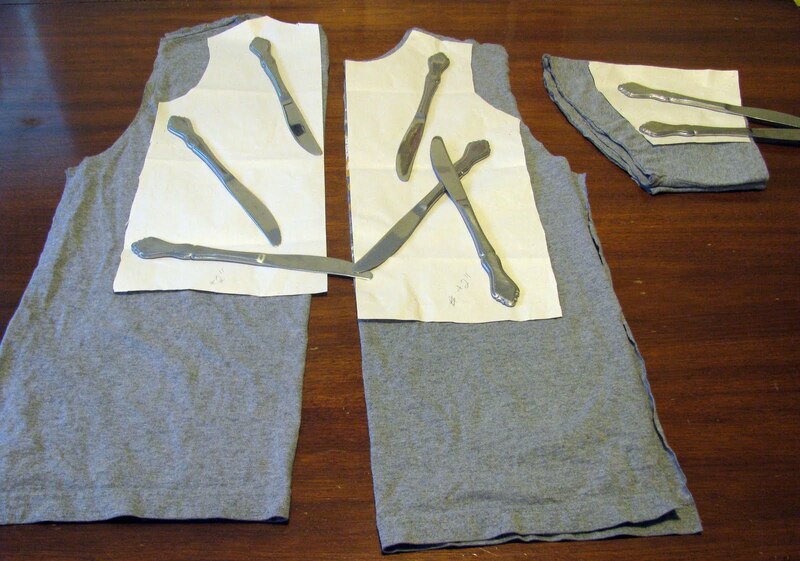 Who would have ever thought that silverware had a purpose in garment construction? Surely not me, until hearing more and more about pattern weights. Many of the pattern weight using sewists I know use the "real thing". Yes, you can buy pattern weights for this specific purpose. But, that means spending money and storing another "one use only" tool. I know others who visit the hardware store and purchase a load of heavy washers. Again, that's spending money, unless you husband has some, non-rusty ones, he's willing to part with. And, again, that's storing a "one use only" tool. But, I heard someone, somewhere, I can't remember where, mention the use of heavy silverware pieces. Genius, I thought. Now, in the good ole days most silverware had some weight to it. Mine, not so much. Thankfully though, the knives are great weights. I cut in my kitchen on my kitchen table, so the knives are wonderfully, and normally, stored right where I need them...in the kitchen. 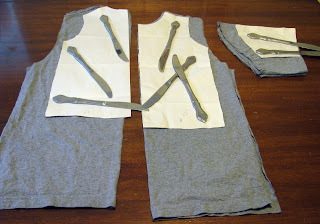 I don't happen to have enough knives to lay out many pieces at once, but rarely use many pattern pieces, especially of one fabric, lol. So my knife supply works for me. It's easy to use them. Lay your fabric out and put your pattern in "it's place". Then spread the "pattern weights" near the lines you need to cut. Even if you only have enough silverware for one or two pieces at a time, simply lay, cut, and repeat. Amazingly they stay in line very well. It's a huge time savor! Curly uses pins as she is still learning the fine art of cutting with some finesse. I think, however, than anyone reading this will enjoy this time saving and easy way to "pin without pins". How very thrifty! I am one of those who use washers from the hardware store (I got more than I need for just 2 or 3 dollars), but then, I don't cut out on my kitchen table like you do. I cut out on my living room floor, in the 18-inch space between the rug and the wall. Ha! My mother taught me to use table knives when I was just a little girl. I made my first dress for myself when I was 10yrs old, and that was 53 years ago! That's all I ever saw her use. She was a farm girl from a poor family in Arkansas, and I guess she learned it from her mother and grandmother. I remember one day after Thanksgiving sale when I was in line behind a young woman buying those expensive weights at Joanns. I told her about the knives and she put down the weights and headed for the second hand store. 8-) Necessity really is the mother of invention! Where have I been? Never heard of pattern weights, but it certainly makes sense. I'll bet you could pick up a bunch of silverware at church rummage sales, a win-win transaction.